As President Trump announced to the world that he would finally put a stake through the heart of the Iran deal -- the signal foreign policy "achievement" of the Obama administration -- Obama's former staffers lamented, rending their sackcloth and smearing their ashes. "I will never forget the dark cloud that hung over the White House in the years Iran was advancing nuclear program & Obama was briefed on all the risks of using military force," former United Nations Ambassador Samantha Power tweeted. "Trump has demolished America's credibility & paved the way for Iran to re-start its nuclear program. 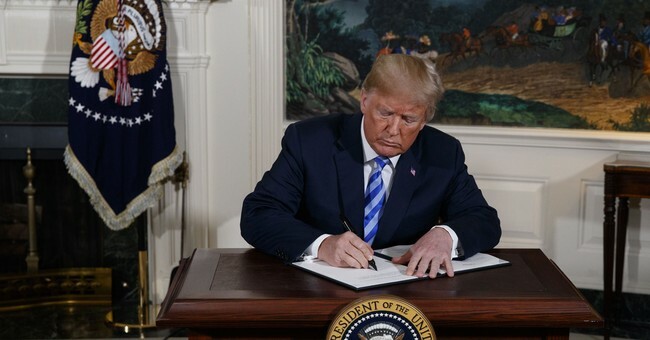 Trump has done the unthinkable: isolated the US & rallied the world around Iran." Then there was amateur-fiction-writer-turned-professional-fiction-writer Ben Rhodes, a former Obama national security aide, who tweeted, "One tragicomic element of Trump's presidency is that the more he tries to tear down Obama's legacy, the bigger he makes Obama look." Meanwhile, former Secretary of State John Kerry, who had been traveling the world in an attempt to conduct his own personal foreign policy on behalf of the mullahs, stated, "Today's announcement weakens our security, breaks America's word, isolates us from our European allies, puts Israel at greater risk, empowers Iran's hardliners, and reduces our global leverage to address Tehran's misbehavior." Obama himself stated, "Walking away from the JCPOA turns our back on America's closest allies." In hearing all of these honeyed voices speak, one might think that Iran has been acting responsibly for the last three years, that it hasn't been pursuing a campaign of horrific terrorism in Yemen and Syria, that it hasn't been sponsoring the takeover of Lebanon by the terrorist group Hezbollah, that it hasn't been funding the Palestinian terror group Hamas, that it hasn't been developing long-range ballistic missiles while leading chants saying "Death to America." One might think that Obama left the Middle East a bright a beautiful place, not a hellhole filled with human carnage bought with dollars spent by Iran but funneled through the United States. None of that is true, of course. Obama left the Middle East a smoking wreckage heap -- a situation so grim that even Saudi Arabia, Egypt and Jordan have been forced to ally with Israel to allay fears of an Iranian regional takeover. Obama and his staff lied repeatedly to the American people about the Iran deal -- and they continue to lie. When Kerry says that the deal will "empower Iran's hardliners," he is repeating an outright fabrication: The hardliners are in charge of the government, and the deal strengthened them. When Power speaks as though Obama alleviated the possibility of Iran's nuclear program, she's lying, too: The deal explicitly paved the way for an Iranian nuclear program free and clear of consequences from the international order. When Obama speaks as though our Middle East allies were pleased by the deal, he's lying: They all opposed it, and they're all celebrating its end.